Polypak Packaging can custom design and print poly mailing envelopes or custom poly mailers to fit your exact requirements and needs. Our use of Rigur® and EnviroTuff® plastic film for poly mailing envelopes and poly shippers assure their ability to travel up and down conveyor belts, slide off traveling trays and easily handle the perils of shipping. The product stays dry and arrives to your customer in perfect condition. 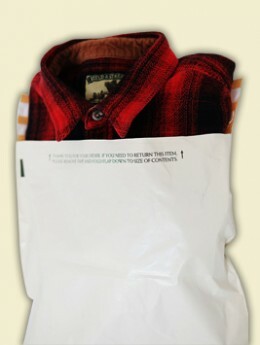 We can make your bags into a reusable Re-Pak™ that provides your customers with an easy and efficient return process. We can print your custom poly bags or poly envelopes in up to eight colors as well as process print. Poly mailing envelopes can be made with up to 100% Post Consumer Recycled Product.